Art is all about the visual expression of your own creativity and spirit. Everybody can learn how to show their own unique response to what they see and feel through drawing, design and craft. 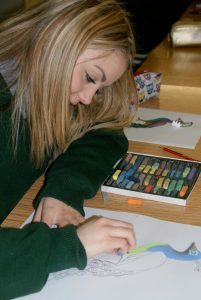 The Art Program at Firhouse Community College is designed for you to learn skills and then explore how to use them in your own way. 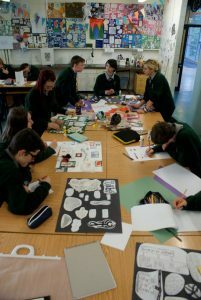 The existing Junior Certificate in Art, Craft and Design still applies to the September 2019 class of 3rd Years. The Junior Cert project begins in October of Third year and you have until May to develop three finished pieces: A Painting or Graphic Design; A 3D sculpture and a Craft. Each student chooses a theme and interprets it in her own individual way. You will present all your visual research and development (teasing out ideas and solving technical problems, early sketches and developed drawings from primary sources) displayed on prep and support sheets with each of the finished pieces. The Junior Cert Marking Scheme awards significant marks for the development and individual problem solving as well as for the skillfully made finished pieces. The point is to show that you can think for yourself and work independently. This emphasis on individual expression and independent learning and student led content makes Art a unique subject. The Junior Cert Art Project and the Drawing Exam are marked by an external examiner and you get all your work back afterwards. There is no written exam for Art at Junior Cert. Students have the choice to choose Art as an X option to continue for the year or to take Art in a 9 week module. 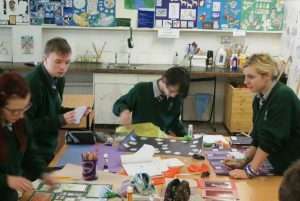 Students build on skills and techniques which will form the basis for Art at leaving Cert. Level. This is a more flexible year for art projects and students often create work to install within the school. Senior cycle builds on skills acquired over the course of Junior cycle taking into account the learners age and artistic ability. The course includes skill development in a range of art areas including drawing, painting, design, 3D, craftwork and the history of art and culture. The leaving Cert is assessed in 6th yr partially through class project work. This project is worked through themes supplied by the department of education. Allocation of marks: Project booklet and realised work 200 marks (completed by April), life drawing exam in May 50 marks, Art History 150. Total possible marks 400.